I thrive for anything imaginative, new, and epically badass. And yay for me, I found all these elements in Ellen Oh's Dragon King Chronicles. Since when do you get to find a book series that focuses on Asian culture rather than more of a European/white dominant one? Or one that doesn't focus on a romance or turn primarily into one? I don't think I've read anything like these books, which is the best thing ever. I truly love Kira. She's a very consistent character who does, while it might not seem like it since she's such an experienced fighter and mature character in general, learn valuable lessons. She's such a strong and noble character who doesn't enjoy moping around too much (which tends to be a popular trend in strong YA characters. I love emotional breakdowns, but I despise constant moping.) I also love how much Kira values her family! She'd do anything for them and her friends, which basically is almost a majority of the plot, besides the whole find-the-prophecy-treasures thing. I can already see how people will be discontent with the lack of romance, but to me it's perfection. To begin with, I'm not big on romance, but for Kira, she's not either. She experiences love through her family and she's completely inexperienced when it comes to loving *whispers* boy-men. So when she does find a boy-man, she doesn't know what to do or how to act and she doesn't like that. Also, she doesn't need some significant other to lean on, and for her to suddenly fall in love would be uncharacteristic and, in my opinion, would ruin the plot. And with what little the author has given us, not only do I want more for later on, but I ship them harder! 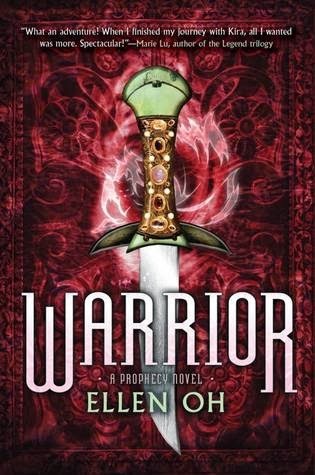 Warrior is almost like the show Supernatural, what with the demons taking over and going all apocalyptic on all the humans. And Kira and her buds must braves these dangers to save the world, essentially, while many don't believe what is happening or believe in Kira, for that matter. I enjoy how the plot (not only for its somewhat Supernatural elements) is set and with it's quick pace, I flew through the pages and was finished with the book in under a day. The Dragon King's Prophecy will possibly always be a favorite series of mine. Oh transports readers right into a Korean fantasy setting, with rich culture and interesting characters. Kira poses as a strong and independent character that doesn't come off as the cliche martyr of the story. 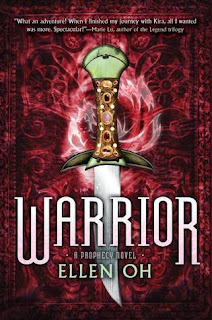 And with Warrior's ending, I'm left wanting more. So obviously, I can't wait to see what happens next and I hope that others will enjoy this book as much as I did.